Nick and I love to host friends. While I love going to other people’s houses and going out to eat, there is something special about gathering people around a table and feeding them delicious food that fills. me. up. And even though we live in a city and enjoy exploring new places, I’m still a homebody at heart. I love to be in my own home. So when I was reached out to about throwing a dinner party that involved avocado inspired recipes, I was on board. I love food. I love feeding people. I love people, period. I love hosting. And I love avocados. Let’s do it! I keep it rather simple when it comes to hosting. In my opinion, all you need is good food and good people and you’ve got a party. But parties, for me, used to feel much more complicated. Mainly because I was anxious around food that I didn’t cook myself because I couldn’t control exactly what was going into my mouth. How would I know how many calories were in that meal?! But as I went along in my journey towards peace with all foods, I realized that sharing meals with others, engaging in meaningful conversation and investing in friendships were really important to me. I valued those things…a lot. I knew I couldn’t live in line with my values and micromanage everything that went into my mouth at the same time. A change had to be made. 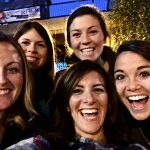 Years later, after walking the hard, murky and challenging path towards intuitive eating, things have changed. Dinner parties and social events where I don’t prepare all the food are now a purely enjoyable experience. I don’t stress about the food anymore. Now I get to actually be present in my life. It’s wonderful. 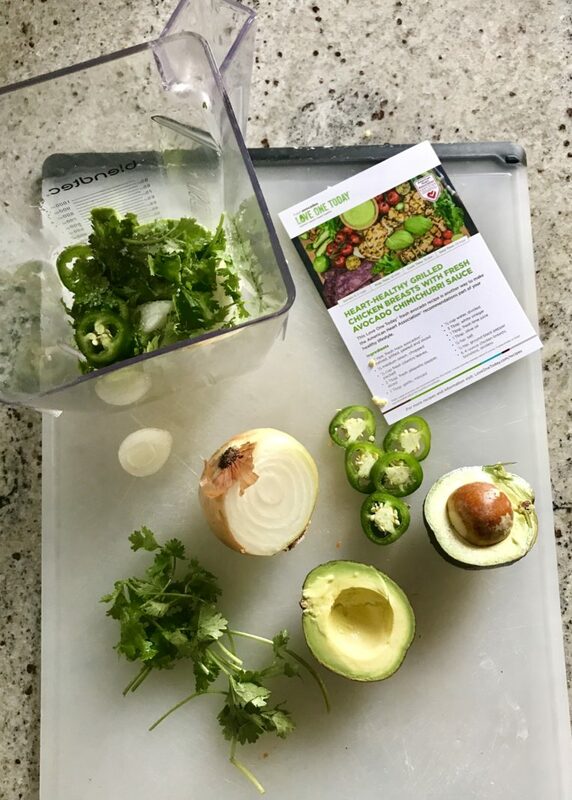 My hope is that this post not only inspires you to keep growing on your own journey, but gives you some fun and simple ways to bring people around a table and celebrate food that is delicious, nourishing and uncomplicated. 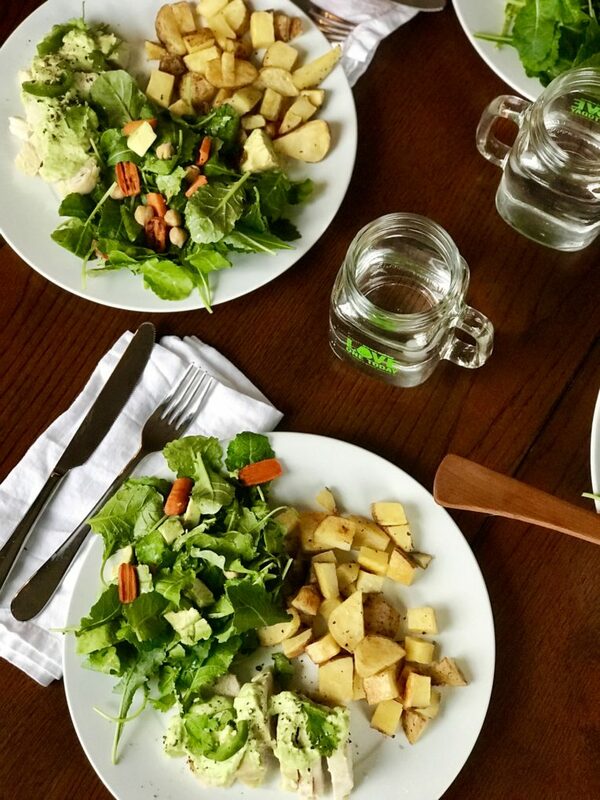 We invited our closest people over for dinner and I made a couple of avocado inspired recipes and some simple roasted potatoes for dinner. Roasted potatoes with a respectable amount olive oil, sea salt and cracked pepper never lets me down. 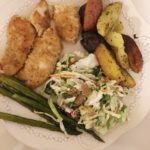 For the main dish we made the heart-healthy baked chicken (we don’t own a grill, but grilling it would be totally delicious!) 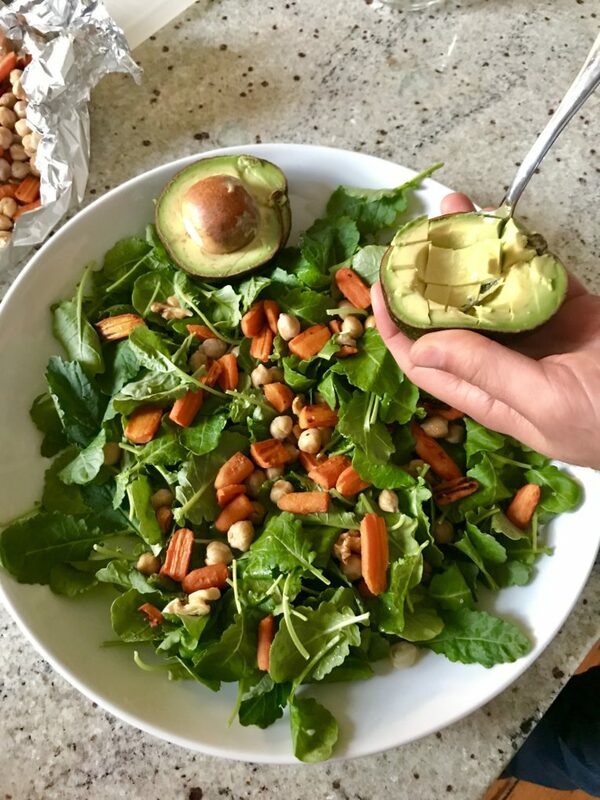 with a fresh avocado chimichurri sauce recipe and for a veggie side I made a kale salad with roasted carrots, chickpeas, avocado and walnuts. From start to finish cooking took me all of an hour, with much of that time being passive. Hosting others or cooking in general certainly doesn’t have to be stressful. I’m all about quick cooking times and no frills while serving up super tasty food. That way you have more time to spend with the people you care about. 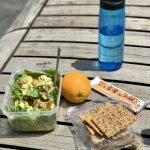 If you find incorporating fats into your day challenging, remember that dietary fats are an essential part of what you eat because they are a major source of energy. Fats also help the body absorb fat-soluble nutrients like the ones found in veggies – especially dark leafy greens. Topping a salad with healthy fats (like avocados and walnuts) actually helps you absorb the nourishing vitamins in your greens. We need those fats! No matter what is on the table, food brings people together. 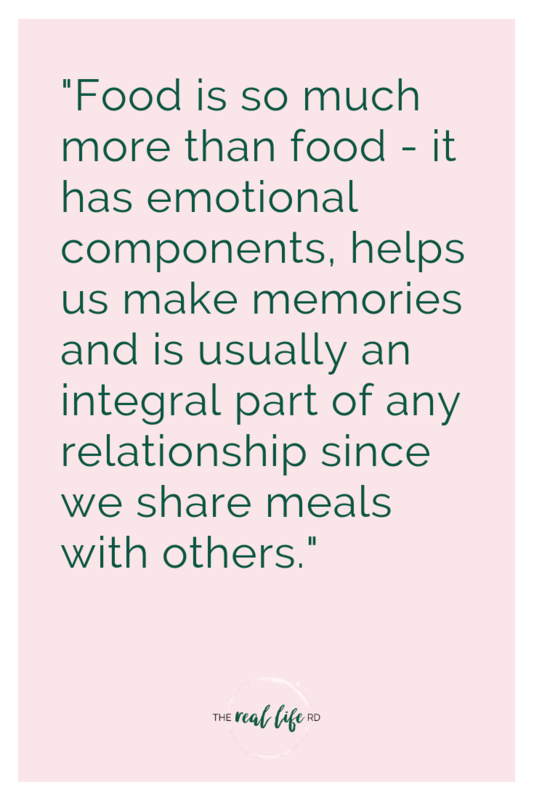 Food is so much more than food – it has emotional components, helps us make memories and is usually an integral part of any relationship since we share meals with others. Food is a connection point. If you think about some of your most cherished memories – some of them or most of them or all of them – involve food. Whether it’s sharing a coffee and a muffin at a bakery, cooking with people you love, hosting a dinner party with friends, or allowing somebody else to cook for you…a memory almost always involves food. I think the people are the most important part. That being said, nutritious, satisfying, delicious food most certainly helps form the connection. All foods are part of a healthy, nutritious diet. All foods. 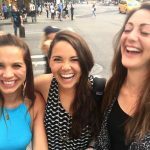 But when we talk about the “gentle nutrition” principle of intuitive eating – after you’ve worked through all the other principles – we know that eating more foods higher in unsaturated fats, like avocados, has been shown to reduce risk factors for disease and promote overall health when compared to foods higher in saturated fats. 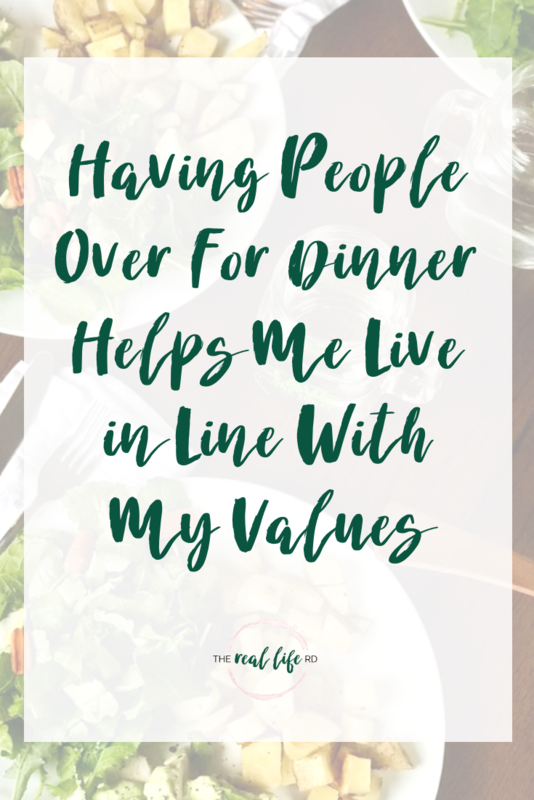 So in addition to being around people I love, living in line with my values, getting good sleep, and managing stress – eating nourishing food is another way I care for myself. And who doesn’t like avocados?! The party was a blast, the food was delicious and we spent the evening with our best people. My kind of night! Avocados are yummy! Although remembering to use them before they go bad is a challenge…it’s hard to know when they’re just right! I just hosted all my family for Canadian thanksgiving and cooked my first turkey. I don’t *love* hosting but I’m okay to do it once in awhile. I stick them in the fridge when they get soft and that will get you another 3-5 days! I can’t wait for Thanksgiving – sounds fun and congrats on your first bird, no easy task! You will continue to enjoy when you have the baby and others can share in her life…though definitely allow them to bring food when you are a tired parent! I thought there is a shift in the nutrition field in which saturated fats like whole milk and whole yogurt actually isn’t as negative for our health as once believed?